This book was originally published with the title Cat’s Eyes. Twelve year old Kate Dawson is unhappy at home. Her widowed mother has remarried and Kate has a stepfather and a six year old half-sister, Emma, who is nothing but a pest. She knows the resentment she feels towards Emma and her stepfather is making her mum unhappy, but Kate is confused by the deep feelings of guilt and jealousy that plague her. One morning, Emma disappears down a mystical looking well. 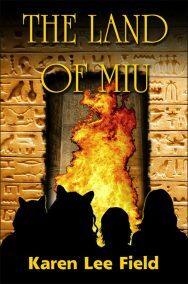 Irritated but worried, Kate follows and the two girls are thrust into the tunnels of Miu, an unknown place built within the lava tunnels of an extinct volcano. They meet a young Miuan princess and her guard, who are on the run, and the girls are instantly swept into a danger that will test their skills, their friendship and their love.